CD to MP3 Ripper - rip audio cd to mp3, wav, wma, ogg, etc. CD to MP3 Ripper rips audio CD tracks into audio formats such as mp3, wav, wma (Windows Media Audio), VQF (Yamaha SoundVQ), or OGG Vorbis, converts MP3, WAV, WMA, OGG Vorbis from one format to another on-the-fly, resamples MP3 to MP3, WAV to WAV, WMA to WMA, OGG to OGG for changing bitrates, frequency, and other options. Download CD tracks' titles from the Internet free CDDB. It's fast, easy to use while powerful. This software offers rich options for your special requirements. 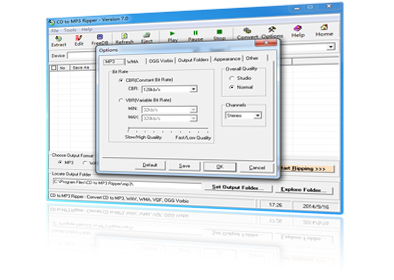 The built-in MP3 encoder supports CBR (Constant Bit Rate) and VBR (Variable Bit Rate) modes. It also supports four channel modes including Stereo, Join Stereo, Mono and Dual Channel. By changing MP3, WAV and WMA settings, you may make a choice between speed and quality. Edit Files (MP3 / OGG Vorbis) ID3 tag information. Copyright © 2002-2019 CD to MP3 Ripper Team. All rights reserved.